The award-winning ad agency of Crispin Porter + Bogusky—based in Miami, Florida—is a self-described factory. Not one that cranks out mass-produced product, but rather one of constant innovation where each new “product” defines them and their future. They succeed by taking creative risks that few others are willing to take and they push technology as far as it can go. 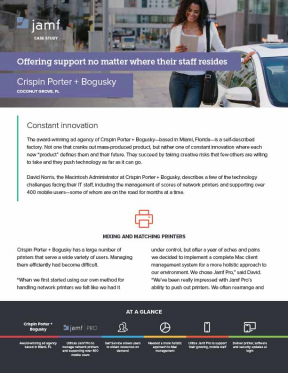 David Norris, the Macintosh Administrator at Crispin Porter + Bogusky, describes a few of the technology challenges facing their IT staff, including the management of scores of network printers and supporting over 400 mobile users—some of whom are on the road for months at a time. Crispin Porter + Bogusky has a large number of printers that serve a wide variety of users. Managing them efficiently had become difficult. David and his team have regained the ability to deploy printers strategically. This helps them balance the needs of the entire staff with the needs of those watching the budget. David also looked to Jamf Pro to meet the challenge of supporting so many remote end users. Now Crispin’s remote end users obtain all of their updates on their own when they log in. IT no longer has to chase down users or manually track who’s current, and users no longer have to announce their return to the office to the IT department.